The Calligraphy Shop by Ben Downing. Zoo Press, 2003. Paper, $14.95. 46 pages. The Hidden Model by David Yezzi. Triquarterly Books/Northwestern, 2003. Hardcover $39.95; paper, $11.95. 72 pages. Inflation of the value of the New Kid on the Block [NKOTB] applies to poetry careers as much as to pop stardom. During more than thirty years of observation, I’ve seen many talents flare only to fizzle out; and some few continue to hold public attention. The readership tends to place its highest hopes on unfamiliar figures, greeting them with a messianic fervor hard to sustain when a second or third book appears. That the flavor of the month is sometimes inept should surprise no one who knows La Rochefoucauld’s maxim: “Il y a des gens qui ressemblent à ces vaudevilles, que tout le monde chante un certain temps, quelques fades et dégoûtants qu’ils soient.” [“There are people who resemble those popular songs that everyone sings for a while, no matter how insipid and nauseating these might be.”] Most NKOTB’s attract attention as risky innovators, but the supposed originality more often than not is just one more uncorking of the same old 1913 bottle of Dada. Which was an instructive carnival hoax worth perpetrating once, but a timid choice for poets coming so many decades later. Although the arts scene can expect periodic bouts of taboo-smashing calculated to provoke press coverage, the phenomenon belongs to the history of publicity, not to art. There must somewhere be an elephant’s graveyard for those books, where you can survey from a safe distance the rusting hulks of yesteryear’s sophomoric razzing, breathless gibberish, and mechanical invective. [private]New kids they may be, but I haven’t heard any exclamatory noise about Ben Downing and David Yezzi. That speaks well for the quality of their work, and my guess is that these poets have staying power. But what if, in the general silence, the readership fails to discover them? Except for the fact that both Downing and Yezzi once took a graduate course I taught at Columbia, I might never have heard of their books. But they’ve both been intermittently in touch since that time, a fact I’m reporting in order to comply with the rules of reviewing, but also to account for having known about these quiet debuts. Ethics or common sense also suggests that comments be concerned more with exposition than with evaluation, so I will try to stick to that, though the temptation to exclaim is strong. such bedrock certainties have led him here. In classical rhetoric an aporia is a doubt, and the five sonnets in this sequence play variations on the uncertainty principle in high (even stately) diction and with adroitly martialed imagery. A resolution of sorts declares itself in the final poem of the sequence. A white peony is cut and installed nearby so that the consciousness being rendered may admire “how bright and fated things look when they bloom.” Brightness falls from the air as fate decrees; but there may be more to it. The sequence recalls Stevens’s “The Poems of Our Climate,” a meditation on a bowl of pink and white carnations, in which the speaker finally concedes that not even lovely flowers can satisfy the “never-resting mind.” That reflection leads Stevens to observe that “The imperfect is our paradise,” his paradoxical solution to the problem of a Creation devoid of deity. We notice, too, that Yezzi’s narrator admires the bright peony mainly because an uncharacterized “you” seems to expect him to. My age, in fact. How had there been a cane? If I seem to be portraying a finical metrist sequestered in some iambic limbo, let me shift focus to content and cite some of the remarkable verse narratives that add variety and punch to this book. Yezzi has had stage experience and he is able to construct characters not only with his physical person but with his imagination as well- the result, absorbing poems such as “Exit Pursued,” which gives us an aging actress in the middle of a drama both actual and staged. The title recalls “Exit, pursued by a bear,” Shakespeare’s most startling stage direction, applied to the character Antigonus from The Winter’s Tale just after he exposes the infant Perdita to the elements in Bohemia. Yezzi’s poem gives us a few details from the play the woman performs in, blending dialogue and stage business with events and thoughts drawn from life. The dramatic vehicle Yezzi invents is set in the 19th century, some of its plot features reminiscent of Ibsen’s Ghosts. There is a middle-aged mother, a pastor, and a son under some kind of threat. Meanwhile, offstage, the unnamed woman is conducting an affair with the actor who plays her son-just as she misses her actual son, who lives a twelve-hour drive away. Near the end she has the thought, “What is done cannot be undone,” a close paraphrase of Lady Macbeth’s “Things without all remedy / Should be without regard. What’s done is done.” Reality is haunted by the stage and vice versa. The poem concludes when she “enters left just as her child’s going.” If we recall the title “Exit Pursued,” the woman has to be regarded as a sort of predator about to devour her “son,” with a sangfroid worthy of Lady Macbeth and the same disregard as to probable consequences. A kind of interpretive mist surrounds this poem and other narratives in the book such as “Woman Holding a Fox,” “Foundry Road,” and “The Hidden Model” (subtitled “A Pentimento”). As such they are fitting company for first-person lyrics elsewhere that render the poet’s incapacity to fathom the sea on certain gray, fogbound evenings. Nature itself has taken on the indeterminacy principle Yezzi discovers at the heart of so much human experience. A melancholic vision, offset in part by poems in which the poet’s calm vote in favor of love between equals or between parent and child strikes a note of certitude he usually backs away from. Offset as well by an implicit trust in art-especially in visual art, witness “Morandi’s Bottles” and an ecphrastic meditation on a Rembrandt print titled “Conversation with the Pharisees.” The Morandi poem notes that much of that artist’s power resides in what is beneath the surface; and the Rembrandt poem places the observer squarely among the caviling scholars who miss Jesus’ point. But the solidity of Yezzi’s conviction that he cannot fathom all the hidden power in a work of art or grasp all that the great teacher taught becomes itself a paradoxical faith, free of hypocrisy and of false consolations. Since we are in the realm of paradox, perhaps it’s apposite to recall Emerson’s “Brahma,” who says, “I am the doubter and the doubt,” a negative catechism suggesting that any god at one with the whole of existence couldn’t fail to be one substance with the free-thinker and his unbelief. Yezzi enacts and rehearses his apophatic theology during the course of several poems (“Red Shift,” “Casco Passage,” “His Boat,” “Invention with Seascape”) where an observer is confronted with maritime equivalents to the Cloud of Unknowing and becomes one of its “cloudy trophies,” to borrow a phrase from Keats’s “Ode to Melancholy.” But then the opacity of a cloud matters less than the fact that rain falls from it as a prelude to the greening of the earth. you organized; fresh oysters for your cat. The Calligraphy Shop, among other things, is a record, like Wordsworth’s, of the “growth of a poet’s mind.” Recalling that the etymology of calligraphy includes Greek kalos (“beautiful”) and graphein (“to write”), we can see that the poems here conduct their moral and esthetic education in the public eye, which takes courage. The volume’s final two poems are cases in point. “Scruples” is short and even slight, its point of departure the title word’s etymology (from Latin scrupulus, “sharp little stone”). The speaker regards them as pebbles to be dumped from his shoe so he can stride panglessly forward. The paradox is that the person who really has no scruples would never broadcast the fact. Willy-nilly, Downing keeps his, so this brief caveat’s main function is to prepare us for what comes directly after. The title poem, set in Istanbul, records the poet’s astonishment at the beauty of Arabic calligraphy being sold in a shop in a market not so far from the Golden Horn. Of course these dizzying examples of Arabic script must be read as an allegory for the “beautiful writing” of poetry as well. He describes them in a complex series of terza rima stanzas, every rift loaded with ore and heightened with ingenious imagery. The last elaborate specimen he focuses on is arranged in an ever-narrowing spiral, its function explained by the vender as a ghost-trap designed to lure its quarry on the strength of the ghosts’ “belletristic curiosity” before it cyclones them down into a cunningly placed bowl underneath for convenient disposal. Downing seems to group himself (why?) with the ghosts hooked by calligraphy’s “Byzantine embellishments of quill”]-and says that he has been led to “reproduce / its tyrannies,” “its ruse / of hanging there in ambush, growing old.” Maybe so, but, again, he disables the ruse by announcing it, labeling himself a compleat angler out to hook his trout and bass in the same breath that posts a warning. Keats in one of his letters said we didn’t like poems that had designs on us. But what if the poem makes a clean breast of it, advertising seductive intentions beforehand? If we strike, we do so in full knowledge and freedom, though perhaps not always aware of the consequences. For, once hooked, readers will almost certainly want to do their own calligraphy in turn. Just that it’s not going to be easy. Poems tossed off in an hour and worth skimming only once will no longer suit us; we’ll have outgrown the easy-listening, shredded prose of our youth. Alfred Corn - who has written 5 posts on Contemporary Poetry Review. Alfred Corn is the author of nine books of poems, the most recent titled Contradictions, which appeared with Copper Canyon Press in 2002. He has published a collection of critical essays, titled The Metamorphoses of Metaphor and a novel, Part of His Story. In 2001 Abrams brought out Aaron Rose Photographs, for which he supplied the introduction. 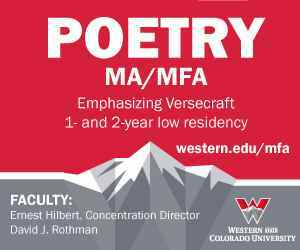 Fellowships and prizes awarded for his poetry include the Guggenheim, the NEA, an Award in Literature from the Academy and Institute of Arts and Letters, and one from the Academy of American Poets. For 2004-2005, he holds the Amy Clampitt residency in Lenox, Massachusetts.